Gravwell’s 2.0 release saw several new high availability features which enable large, fault tolerant, and geographically distributed Gravwell clusters. The 2.0 release establishes Docker as a first class citizen for deployment. Using environment variables, it is easy to rapidly roll out a Gravwell cluster using Docker. Release 2.0 marks a major milestone in reliability and ease of deployment. The myriad of improvements and new features can be found in the change logs, or go checkout our release announcement post. If the command does not exist or if an error is displayed, visit https://docs.docker.com/ to get a docker installation sorted out. The second step in building a Gravwell Docker container is obtaining an installation package. If you do not have access to a Gravwell release, contact sales@gravwell.io for a demo release. We will be using the official version 2.0.1 release packages for the Indexer, Webserver, and Federator components. For the Simple Relay and Netflow containers we will build from source available at https://github.com/gravwell/ingesters and hand roll a Dockerfile (it’s easy). For the purpose of this post we are going to build the smallest Gravwell container possible using a busybox image that is freely available on the Docker hub (https://hub.docker.com/_/busybox/). Any reasonably up-to-date Linux image will do (kernel 3.2+); for bare-metal deployments we prefer Debian based distributions but the installers will happily support any distribution that uses SystemD. We are going to be starting with a very minimal gravwell.conf file that establishes two wells: one for netflow and pcap, and one for everything else. Notice the lack of Indexer-UUID, Webserver-UUID, Ingest-Auth, Control-Auth, or any Backend-Target directives; we will be providing them via configuration variables during deployment. docker build --ulimit nofile=32000:32000 --compress --tag gravwell:indexer_2.0 --build-arg INSTALLER=gravwell_installer_2.0.sh --build-arg CONFIG=gravwell.conf . Gravwell is designed to scale wide which means lots of threads, file handles, and network connections. The --ulimit argument tells Docker to allow the container to really stretch its legs. Without the ulimit directive Docker will limit access to resources, causing errors. 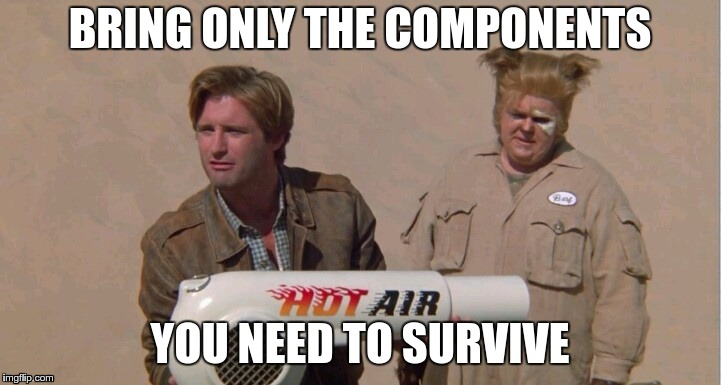 Compress directs Docker to compress the resulting docker image. Tag the docker image as being part of the gravwell repo and named indexer_2.0. Tell Docker that we want to override the INSTALLER variable in the Dockerfile with the value “gravwell_installer_2.0.sh”, basically setting which Gravwell installer to use. Tell Docker that we want to override the CONFIG variable in the Dockerfile with the value gravwell.conf. The build command should display the progress of each step, as as the output from the installer, culminating with a success message and the Docker image ID. docker build --ulimit nofile=32000:32000 --compress --tag gravwell:webserver_2.0 --build-arg INSTALLER=gravwell_installer_2.0.sh --build-arg CONFIG=gravwell.conf . docker build --ulimit nofile=32000:32000 --compress --tag gravwell:federator --build-arg INSTALLER=gravwell_federator_installer_2.0.1.sh --build-arg CONFIG=federator.conf . While the ingesters are freely distributed and/or open source, the core Gravwell product (Indexer and Webserver) is not. It is against the licensing terms to distribute or share a Gravwell license (which was installed when we built the Indexer and Webserver images). DO NOT upload your Indexer or Webserver docker images to the public Docker hub, your license file and distribution are tied to the newly built container. Gravwell reserves the right to terminate leaked and/or shared licenses. The installers make building a Gravwell container extremely easy, but if you have rolled your own ingester using the Gravwell ingest API or you are using one of the many ingesters that do not have formalized installers you will have to perform a few more steps. This section will lay out the steps required to manually prep a Docker image using an ingester built from source. Before you begin, make sure you have a functioning Go installation, preferably using Go version 1.10+. We will be using a Debian based Linux distribution as the host, but we will be building statically linked binaries so it doesn’t matter which distribution you build on or which container we ultimately deploy to. The CGO_ENABLED=0 prefix tells the Go compiler to disable CGO, enabling a static binary. The resulting binary is directly installed in your $GOPATH directory. Copy the resulting binary from the $GOPATH to our current working directory. docker build --ulimit nofile=32000:32000 --compress --tag gravwell:SimpleRelay --build-arg BIN=SimpleRelay --build-arg CONFIG=simple_relay.conf . Lone Starr would be proud. docker build --ulimit nofile=32000:32000 --compress --tag gravwell:netflow --build-arg BIN=netflow --build-arg CONFIG=flow.conf . Deployment is relatively simple and requires issuing a single Docker command. Due to the extremely minimal configuration files used to deploy the indexer and webserver images, we need to provide some configuration parameters via docker environment variables. We can pass the configuration environment variables via the command line, or via a file. Both methods will be shown. For the purpose of this post we are going to deploy 6 indexers using a common indexer image. In order for our indexers to operate appropriately we need to inject two pieces of information: the Ingest-Auth and Control-Auth parameters. The Ingest-Auth parameter is used to authenticate ingesters against the indexer. 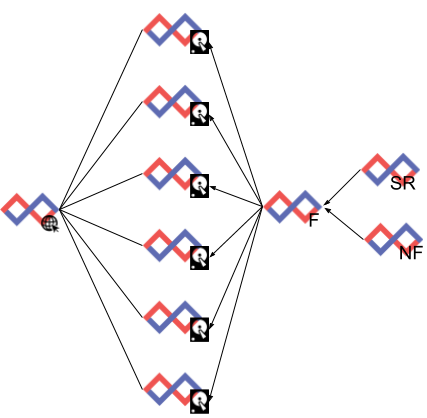 Ingesters and indexers must share the same authentication token. Allocate 4GB of memory to the container. The container won’t reserve the memory immediately in the same way that a full up virtual machine would, but rather we are telling Docker that this container can use up to 4GB of memory. Allow the container to use the equivalent of 2 CPU cores. This is a relatively soft estimate and the complexities of process scheduling, CPU frequency scaling, cgroups, and Hot Pocket thermodynamics are beyond the scope of this post. Name the container. If we don’t provide a container name Docker will pick one for us; Docker names can range from the uninspiring inspiring_wing to the truly epic hardcore_beaver. Once the container starts detach from the console and run in the background. Not including --detach will keep STDIN, STDOUT, and STDERR attached allowing you to see debug messages or provide input. Once the container exits, delete its container image and act like it never happened. Attach the container to the network gravwell that we defined earlier. Assign the container the IP 172.18.0.100 in the gravwell network. You can only assign IPs manually if the container is being attached to a user defined network. Generate a UUID using the uuid command and pass it in via the environment variable named GRAVWELL_INDEXER_UUID. The GRAVWELL_INDEXER_UUID environment variable is used by the indexer to populate the Indexer-UUID configuration parameter if it is not set. For more info see the Gravwell documentation page on configuring environment variables. Pass in an Ingest-Auth value of SuperSecretIngest. Pass in the Control-Auth value of SuperSecretControl. Start the container using the gravwell:indexer_2.0 image we built earlier. We should now have 6 indexers up with a single web server connected to them. Let’s check the status of our containers. Everything appears up. What does the Gravwell interface have to say? Checking the Remote Ingesters tab under System Stats shows that our ingesters are up and ready to go. 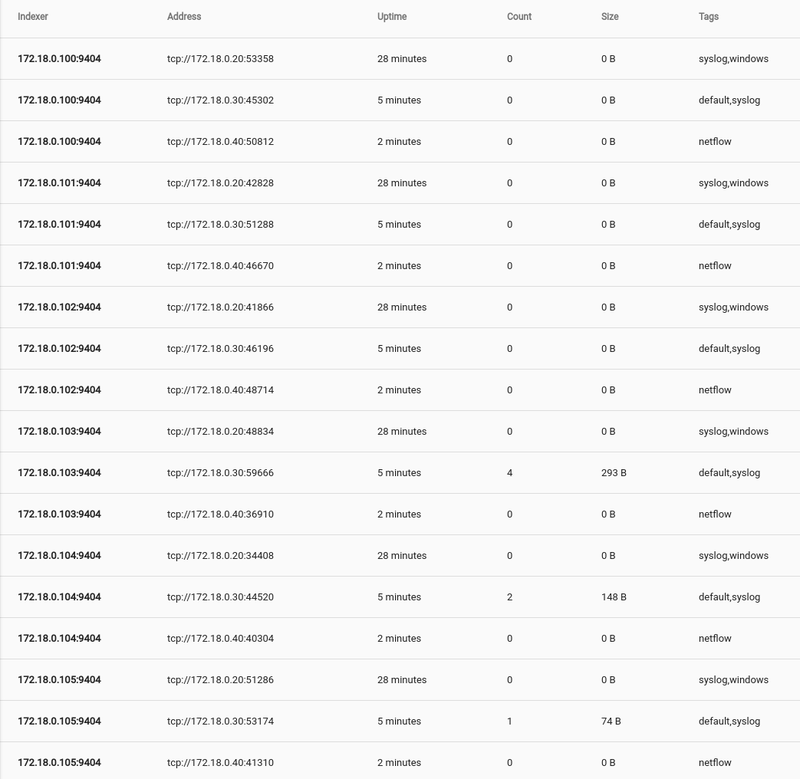 In order to kick the tires of the newly deployed Gravwell cluster we fired up an entry generator that throws line broken log entries as fast as it can. 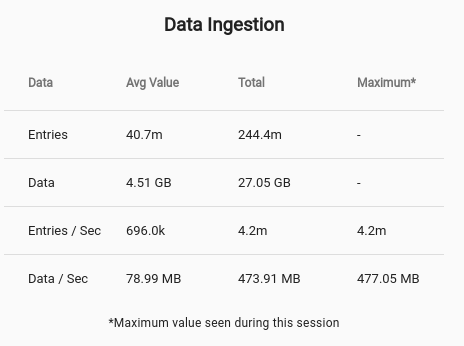 For the purpose of this blog entry we decided to ingest Goonies quotes, the official unit of measurement is SPS (Sloth’s per second); this cluster does 4.2 million SPS. After about 30 seconds we have approximately 250 million pieces of our childhood stored in Gravwell and ready for searching. We configured the indexers with two wells. The entries coming from the ingest benchmark flow into the Default well. The query covered approximately 250 million entries and 27GB in about 19s. Pretty respectable for a 65W CPU that costs less than a ticket to Disneyland. Gravwell set out to tackle three primary problems in the security analytics space: ingest and query speed, time to value, and data flexibility. This blog post started with an installer and made it to a multi-node distributed analytics cluster in just a few minutes. Deployment with Gravwell is a snap. The next post in the series will examine a distributed Web Server setup that load balances and survives failures, then we will do a deep dive into the replication and age out systems that let you build a Gravwell cluster that takes a licking and keeps on ticking. If you are ready to get Gravwell deployed in your environment and get visibility into all of your data, sign up for a free on premise trial. 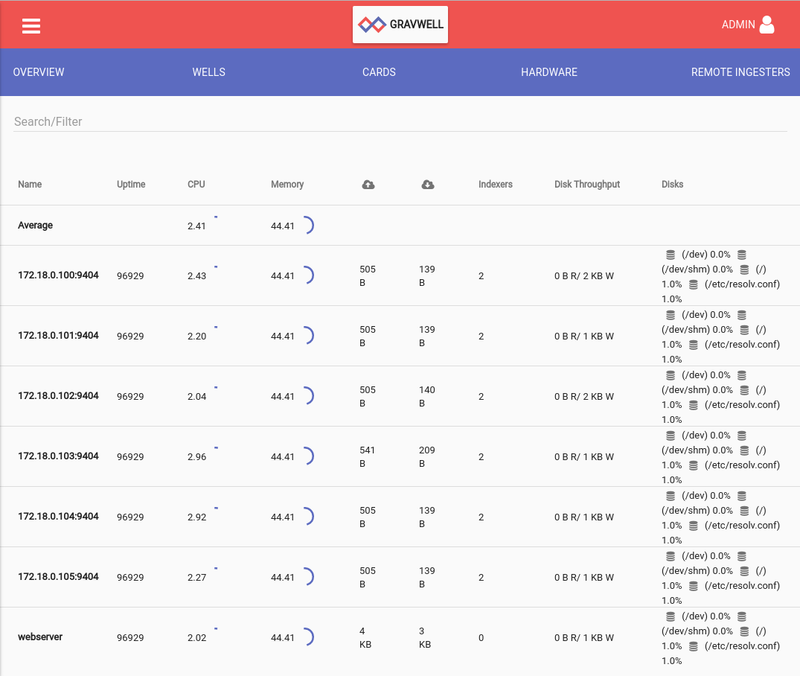 If you would like to play in our sandbox visit https://www.gravwell.io/sandbox-trial for a test account on our Drafthouse cluster. The Drafthouse cluster contains security data, netflow, pcap, Reddit discussions, Hackernews comments, and the entire Shodan firehose feed.